Aruna Khanzada, who photographed our chefs and their dishes, was born in Singapore, where culinary excitement derives from a lively ethnic mix of Indian, Malay, Chinese, Japanese and European. Many who came to trade stayed on to work, settle, inter-marry, cook and exchange recipes, creating an exciting Singaporean cuisine. Aruna, grand-daughter of an Indian silk and spice merchant, dates her lifelong craving for colour and spices back to the thrilling smells in his old-fashioned shop where she played on the floor as spices were ground. In 1979 Aruna came to London to study law and, pining for home-cooked dishes like Hainanese Chicken Rice, she befriended a Chinese Singaporean student who had learned this simple dish from a hawker. On Tuesday evenings Aruna would join him at the stove in the International Students’ House and soon she could turn out a reputable Hainanese dish herself. Her mother, a doctor who seldom cooked at home, would occasionally visit her daughter in London – and Aruna discovered an unsuspected maternal culinary talent. 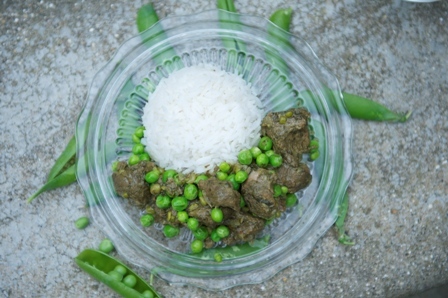 Mum taught her that Indian cooking is not all fiery chillies and the alarming spatter of whole spices hitting hot oil. “Less is more” became Aruna’s motto for gentle dishes like the herby, garlicky, long-marinated and slow-cooked lamb recipe below for which the cook controls the chilli-heat. Marinate meat the day before, or at least four hours ahead. Pound garlic, mint and coriander to a fine paste. Add soy sauce, vinegar, powdered spices and sugar to the paste and mix well. Cut lamb into bite-sized pieces, trimming off conspicuous fat, but don’t be too ruthless – lesser lumps will melt away in cooking and enrich the sauce. Put meat in a large polythene food bag and add the marinade. Seal the bag and “knead” it, working the marinade into the meat. This allows you to get the flavours deep into the meat whilst avoiding messy fingers. At this point you could use the end of a rolling pin to gently pound the meat through the bag to help tenderize it (not too hard or you will split the bag). Refrigerate meat in the bag, remembering to remove from fridge in time to reach room temperature before you cook. Heat the oil and butter in a large, heavy based pan for which you have a lid, and add the cinnamon. When the oil begins to give off a gentle aroma of cinnamon, tip meat and marinade into the pan and sauté gently. Stir in chopped onion and tomato and salt to taste, bearing in mind saltiness already in the meat from the soy sauce in the marinade. Gently cook over medium heat, stirring regularly until it reaches simmering point, then cover the pan immediately so the meat simmers gently in its own juices for 1-1½ hours until very tender. Try to avoid lifting the lid as the flavour comes from meat cooking in its own juices, so you don’t want it evaporating at this stage. When meat is cooked, remove from the pan with a slotted spoon and keep warm in a bowl. Turn up heat and reduce the juices by half. If you have not got the time to make a reduction you could add a tablespoon of corn starch mixed with cold water to the juices and simmer to thicken it. Cook peas separately in salted water till tender then drain. Return the meat and peas to the sauce. Garnish with coriander leaves and a squeeze of fresh lemon juice. Serve hot, with steamed rice.